Mow a maze into a section of lawn and let the fun begin. Locate an open area of lawn and mark the middle with a large object like a ball. Lower the mower’s blade to create the pathways. Mow a small square around the marker about 2 to 3 mower widths wide. Make concentric squares around the center square. Leave one-foot wide strips of un-mown grass between each set of mown pathways. These will be the walls of the maze. Once you have completed the squares, begin connecting them by mowing doors between the paths. 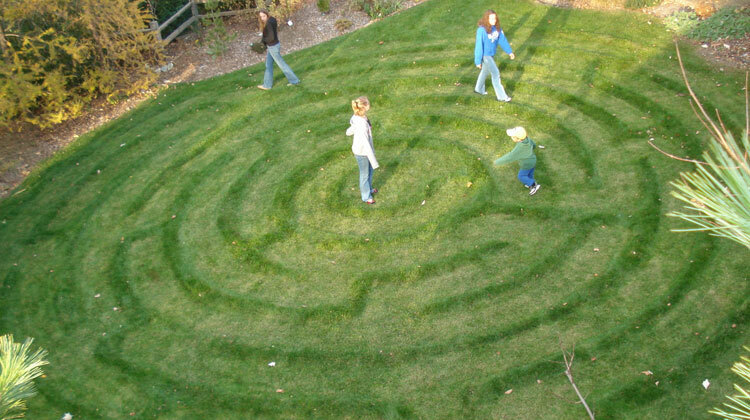 Create a meandering trail from one or more entryways to the center of the maze. Be sure to add some dead ends to make finding your way to the center more challenging. A bit more information: See the Grow and Mow a Lawn Maze story, step-by-step images and more detailed directions from Mike’s daughter, Sara. Create your maze when the grass is actively growing. Mike lives in Wisconsin and has a bluegrass-fescue lawn. Adjust mowing height and timing for the grasses you are growing.